The Schwinn Deluxe Child Carrier offers a trusted product with its branding that has becoming very popular in the biking community. It is designed to provide a firm, secure and safe carrier for children and attaches to the frame of your bike directly without any additional component for support so that you don’t leave your child behind when you go biking. It has a lot of safety features incorporated in the design as only high quality materials are used for the construction making it strong and tough, yet lightweight. The design allows for the child carrier to be located over the rear tire and behind the rider as this configuration allows for more balanced ride than when it is mounted in front. It also protects the child from winds as they are not exposed fully to the airstream. The carrier comes with a weight restriction of forty pounds and they come with a strong harness with a quick release mechanism. Comes with toddler seat that is mounted on the frame at the rear of the bicycle and attaches easily to most bikes for adults. Strong lightweight, polypropylene constructed with polypropylene material thus providing a lightweight, yet tough and durable product. Comes with restraints made of Velcro for the leg and a harness with a quick release mechanism and extra padding for the cross bar thereby providing improved safety. Features a spoke and spring loaded guard. Suitable for toddlers weighing not more than forty pounds. The Schwinn Deluxe Child Carrier offers a quality product that delivers highly safe protective features for toddlers. If you have a ten millimetre wrench and Philips screw driver, then you can install this product easily to the frame of your bike. The carrier incorporates an adjustable strap for both the foot and legs, a double strapped harness for the shoulder and bar that restricts the laps. 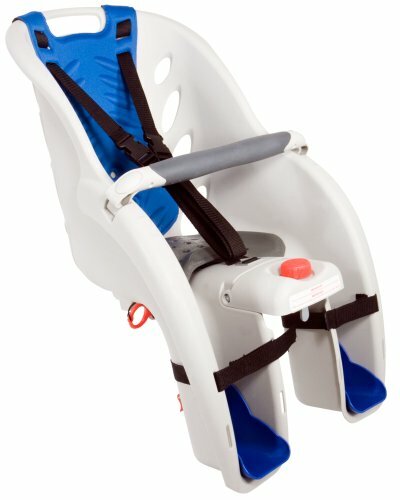 With these entire configurations, it is difficult for your child to fall off so long as the restraints are used properly. Note that as a safety precaution, if your bike comes with a rear suspension, then it is not advisable to mount the carrier on it since the shock absorbing characteristics of the suspension will be transferred to it and will cause discomfort. Generally, if taking your child along with you on rides is a must and they don’t exceed forty pounds, then this is the best product for you to buy.